Court has been adjourned until Friday. 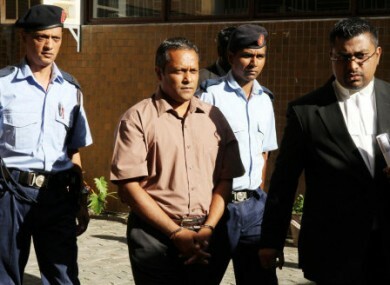 Sandip Mooneea arrives at the Supreme Court in Port Louis, Mauritius. LAWYERS FOR THE second man accused of killing Michaela McAreavey in January 2011 closed their case today and court has been adjourned until Friday. Counsel for the prosecution will make their closing statements on Friday and defence attorneys will make their submissions on Monday, 9 July. The judge will then sum up the trial but did not give an estimated date for a ruling. All witnesses for the prosecution and defence have now been heard. Today, a representative from Mauritius Telecom confirmed that a call had been made from the mobile phone of Sandip Moneea at 2.45pm on the day the 27-year-old newly-wed was killed. The 42-year-old said he called his sister at the time to ask how his nephews got on in school that day – not to ask for advice after committing a crime, as the prosecution has argued. Moneea denies allegations that he murdered the Tyrone schoolteacher and daughter of GAA manager Mickey Harte. The court heard that records show a telephone conversation of four minutes and 18 seconds at 2.45pm. “This time is based on our MSC server which is synchronised to our main server in Cassis [a suburb of Port Louis], which itself is synchronised from a GPS satellite,” said a technician when answering questions from the defence lawyer. Moneea’s sister Gujadhur Malah, a resident of Goodlands, corroborated her brother’s story on the witness stand yesterday. Also up in the witness box today was a gardener from the former Legends Hotel where the McAreaveys were spending their honeymoon when the tragedy occurred. Chandra Peertaub challenged the version of events given by a previous witness for the prosecution, Ravindradeo Seetohul. He said that he saw Moneea head towards room 1025 at 2.25pm and had asked a gardener the time. Peertaub said he was the only gardener working in the perimeter of the block De Luxe and the only person to ask him about the time that day was a security guard. The last witness called was Moneea’s housekeeping manager. He also testified in favour of the former floor supervisor, saying he was informed of the incident in room 1025 by the accused as the latter had claimed. He also said that he never had any complaint regarding the behaviour of the ex-employee. Asked another question by the lawyer for the other accused man, Avinash Treebhoowon, the manager said that he was also never subject to any complaint from client or management. Email “Michaela McAreavey murder trial nearing an end”. Feedback on “Michaela McAreavey murder trial nearing an end”.